In this week's Fintech Spotlight, we meet Neighborly and their platform, connecting investors with municipal projects that they care about. Having grown up in San Diego and following the local sports teams, I became a pretty avid fan of the Chargers. Even though I am now years removed from living there and reside on the other side of world, I’ll still find myself following up on my favorite NFL team and overall news from the city. For Charger fans, it’s become a bit of a tough time as the team faces a possible relocation to Los Angeles if a new stadium can’t be built. But, what if instead of having to tap public money, fans could utilize a crowdfunding campaign, with the possibility of acquiring a small ownership stake or other incentives to raise a portion of funds needed to build a new stadium. In a different case, but similarly affecting California, William Shatner floated the idea of a multi-billion dollar Kickstarter campaign to solve the state’s water crisis. Perhaps crowdfunding could and should be the future of public finance. Such a model would allow citizens to back projects that they care about, and possibly even make a by participating in the deal. One firm aiming to make this a reality is Neighborly. Based in San Francisco and counting Ashton Kutcher among its list of investors, Neighborly is creating a platform to allow its users to invest in municipal projects they care about. The platform works by listing municipal bond offerings and their associated project, with investors able to review programs they want to back and invest in. While not yet a pure crowdfunding platform for public finance, Neighborly appears to be bringing us a step closer to this reality by connecting investors with specific municipal projects they care about. 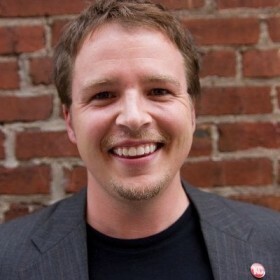 Taking a closer look at Neighborly, and to learn whether crowdfunding can become the future of public finance, in today’s Fintech Spotlight we connect with Neighborly CEO Jase Wilson for a Q&A session. Among topics of discussion are my Chargers, whether municipalities will partner with crowdfunding platforms, and Neighborly’s upcoming launch. Just to understand the business model correctly, is Neighborly slicing up municipal bonds to make them more accessible for investors or are you creating a different type of investable security? Neighborly is making it easier for citizens to invest in their local community by eliminating all the barriers and hurdles to finding the right municipal bond and making that investment. We are selling whole bonds, not slicing them up. The best part is that anyone can invest — you do not need to be accredited or meet a minimum level of investment savviness. Any retail investor who wants to be able to support their community can join and invest with Neighborly. In the long run, we plan to work with the industry to help bring down the minimum denomination, currently at about $5,000 per bond, so we can bring many more people into the market. What type of regulation do you need for this? Currently, none. This is already happening everyday. We are simply making it easier to invest, though someday we might explore better ways for communities to borrow in the first place. As a crowdfunding platform for munis, have any of the rules from the JOBS Act been necessary for Neighborly to come to market? Proudly to say, nope! Anyone can invest, regardless of income level or education. Our buyers consist of people across the US from all backgrounds. What municipalities is Neighborly working with to assist in creating debt sells that best fit your audience? Right now we are focusing on the buy-side by helping spread the word and bring new investors into the market. In terms of the sell-side (issuers, municipalities, etc), we are speaking to a handful in the SF Bay Area who are equally excited about what Neighborly is trying to improve. Do you envision that in the future Neighborly investors will band together to suggest public finance projects for municipalities to work on? Yes, definitely. That’s a long-term play given the momentum required to pull off an effort like that but it’s definitely something we’d love to do. Currently in California there are two NFL teams (the San Diego Chargers and Oakland Raiders) that potentially will be moving to LA. In this example you have large populations that don’t want to see taxes raised to keep their teams. Do you envision in the future that municipalities will begin to use crowdfunding for public finance to raise money for projects such as sports teams where only a portion of the population has a strong desire for the end-product? That’s an interesting example because there is high affinity among a select group of individuals. It’s been a hot topic in the news lately. In fact, there was a recent segment on John Oliver’s Last Week Tonight about this exact topic. Neighborly doesn’t take a position on this right now except to say that whatever route cities decide to take, we will be there to help the city/team/fans raise the money necessary to build better and safer stadiums. What are Neighborly’s launch plans in terms of timing and states you plan offering investments in? We will likely start with high-affinity muni bonds, like parks, green spaces, and education. We’ve noticed strong interest in California, New York, Missouri, and Illinois. That said, we are open to working with any municipalities that are excited about what we are trying to do.